Tiffany Daune writes stories about magick, love and dark creatures lurking in the shadows. She is the author of Coral and Bone (The Siren Chronicles Book One) for which she also won a Watty in the category of trailblazers. When not lost in Editland, you can find her reading a book from her towering TBR pile or kicking back and watching movies with her family. She lives on an island in the Pacific Northwest surrounded by mermaids that are much nicer than the ones found in her books. The world that Halen lives in is different from what she ever expected or believed. Unable to stand even being around normal people without earplugs, Halen is stunned to learn that there are secrets about her that she does not know or understand. The world is full of magick and mystery and it’s also filled with people determined to keep Halen alive, no matter what they may have to do or risk to accomplish that mission. Dax, Tage, Ezra and plenty more are going to have to do everything in their power to stop the evil that wants to destroy Halen before she can achieve her mission, but will that even be enough? Coral and Bone by Tiffany Duane will definitely leave you wanting more. I couldn’t stop reading this book from the moment I clicked on the first page. The characters seemed so real and when I thought maybe at the end of the page I could put the book down, something incredible would happen and I’d have to keep going. I absolutely loved Halen and of course who couldn’t love Dax? There was plenty of action and adventure and I loved all the magick as well. I hope there is more to come. Coral and Bone is a book that I would most definitely recommend to all of my friends and any magick lover out there. You won’t be disappointed with this amazing read. Halen Windspeare cannot figure out why she continues to sketch, over and over again, the same boy, capturing his impish grin, wishing he could be real. So opens Coral & Bone, by Tiffany Daune. Halen and her mother just moved back to the place where Halen’s father had drowned earlier. Irritated by a schoolmate, Tage, and aware that her mother and her mother’s friend, Daspar, are keeping secrets from her, Halen experiences blackouts that send her to the nurse’s office. Before long, she learns that she is no ordinary girl. In truth, she is an incredibly powerful siren, and only she can save the three worlds, Earth, Elosia and Etlis from the evil doings of Asair, the last blue moon siren who came before her. To do so, she must learn to use her magic. Collecting a wide range of friends and assistants, including the boy with the impish grin, Dax, Halen must battle the mermaids and face her dark thoughts in order to gain access to the prison in which Asair is kept so as to destroy him. After all the falsehoods her mother, Daspar and Tage told her in the past, and given the secrets she learns about Dax and her father along the way, will she be able forgive and then learn to trust those she loves enough to see her mission through? Tiffany Daune presents a story that young readers are sure to enjoy—particularly those who seek stories of magic, mermaids and different lands. In Coral & Bone, Daune offers some witty prose (“Three months in a new school and already she would qualify for a frequent visitor card” to the nurse’s office), some interesting word pictures (“Black birds from the mermaids’ vision swarmed her thoughts and she let them peck her broken heart.”), some poetic prose (“The bright light was like a spray of sour lemon.”) and some bits of wisdom (“Let your heart guide you, not your fears. And not revenge.”). I found the teen-centered conversations believable and at times, amusing (“’So what you’re saying is I’m Earth’s last hope,’ Halen said . . . ‘No pressure.’ Ezra smiled.”) Most of all, I genuinely appreciated that this read did not delve into behavior and language that some might find objectionable for the young crowd. Readers will also be delighted to know that Daune wisely set up the story—and its conclusion—for natural sequels. Coral & Bone is a young adult fantasy written by Tiffany Daune. Halen is not terribly happy with her life when we first meet her. Her mother has moved them back to Rockaway Beach, Oregon, and Halen misses bookstores and the big cities they had lived in before the move. Rockaway Beach also holds too many bad memories for her, as she still can see her father drowning on their last swim together. Halen has become hypersensitive to sound and must wear earplugs to drown out others' voices, and strange things happen when she gets angry, like shattering glass and floods. She's already got a reputation at school for being weird, and Tage, the Goth girl who rolls her eyes every time Halen talks to her, and her guardian, Daspar, have become a not entirely welcome part of her and her mother's lives. 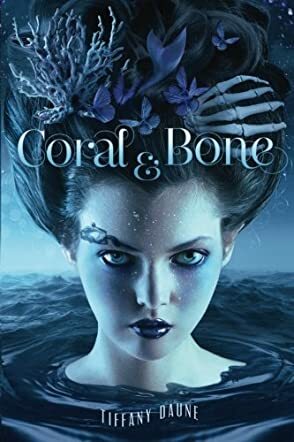 Tiffany Daune's young adult paranormal fantasy, Coral & Bone, is a fast-paced and exciting story that had me hooked from the very first page. Halen knows nothing about whom or what she is, and the reader gets to discover Daune's world through Halen's eyes. We watch as she learns just how big a role she has to play in the world's future and can empathize with her anger at being lied to and her desire to reject her destiny. Coral & Bone is Halen's coming of age story, and it's grand to see her grow from a self-conscious, isolated girl into a young woman of power. She sets out upon her quest with a marvelous set of companions, including Tage, who is actually pretty cool, and Dax, whose face was strangely familiar to Halen before they even met. Author Tiffany Daune leaves a few tantalizing hints at the end of Coral & Bone, suggesting that a sequel is in the works. I certainly hope so.